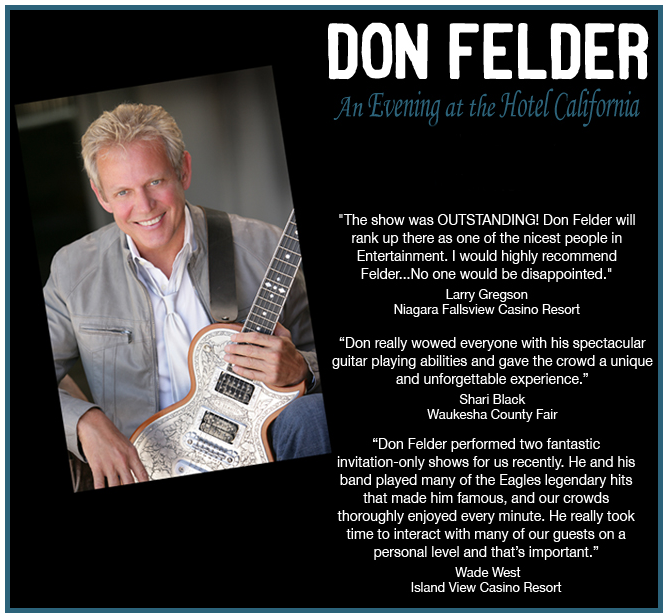 With close to forty years' experience in the field of popular music, songwriter and guitarist Don Felder has captivated audiences worldwide. Don's unique ability to create special musical moments with his dynamic and engaging live performances and his intuitive understanding of clients' expectations has made him one of today's most popular concert attractions. Formerly a long standing member of the quintessential American rock group THE EAGLES, today world class guitarist Don Felder takes center stage. A New York Times' 2008 best selling author of HEAVEN AND HELL: MY LIFE IN THE EAGLES - 1974-2001, an autobiographical road trip of his life and times with the band, his long-awaited second solo album entitled ROAD TO FOREVER was released in 2012 and enjoyed radio success on the adult contemporary chart. An accomplished songwriter, Don composed the music to THE EAGLES' number-one hit HOTEL CALIFORNIA as well as the movie soundtrack cult classic HEAVY METAL (Takin' a Ride). Don's compositions have recently been featured in U.S. television hit series as diverse as HOMELAND, RAY DONOVAN and SOUTH PARK. When not out on the concert circuit performing with his band, Don is at work on his next studio recording project.